There are many times where I can't really devote the time to go down and work on the layout, but I can work in small chunks of time while working on something else at my desk. Often this is a combination of working on models and research (and writing an occasional blog post). A common catalyst is the acquisition or announcement of a new model. One such group on my bookcase/desk is flat cars. The F30A that I posted recently was one such model/experiment. Instead of waiting to find a(n affordable) Sunshine model, I figured I'd see how hard it was to modify the underframe of the Bowser model. That was a result of getting the Owl Mountain Models SP F-50 and Espee Models SP F-70 flat car kits. Once I start looking at a class of cars, I tend to look at what I might need. There are two general directions I work from in determining a roster. The first option is to look at the available models, starting with the easiest ones - RTR plastic, as well as some that are available only as kits. In this case there are a number of good options, and resources (such as Richard Hendrickson's Railmodel Journal articles, Railway Prototype Cyclopedia, and the knowledge of the Steam Era Freight Car modelers in general. Based on an NC&StL Prototype, it's also close to DL&W, SP&S, SSW, CN, CP and NYC with 12 stake pockets. Ertl produced an RTR car based on the same prototype. I have no idea whether there are differences between the models. Ted Culotta wrote an article about modeling these cars in Prototype Railroad Modeling Volume Four (available from Speedwitch Media). I'm also working on using it as a basis for NH 36' flat cars. This is a very accurate model, and as far as I know all of the roads released are prototypical. In my case I'm starting with ACL, C&NW, C&O, CGW, CIL, CRR, D&RGW, I-GN, ITC, L&N, M&StL, NKP, NP, RI, SOO, UP, and WM. EJ&E would be another good choice due to the number rostered. Ted also has an article about these cars in Railroad Prototype Modeling Volume Four. Another very accurate model, although the laser cut wood deck is too thick and tends to delaminate. I'm experimenting with removing it and using a styrene board-by-board replacement. The War Emergency ones are visually identical, the only apparent difference is that some of the crossties are wood. Again, I believe all of the released models are prototypical roads, but the NH is a must have for me, of course, and NYC rostered 1,000 of them! The ERIE and CRP are the other ones I'll definitely roster. PM had 350 as well. 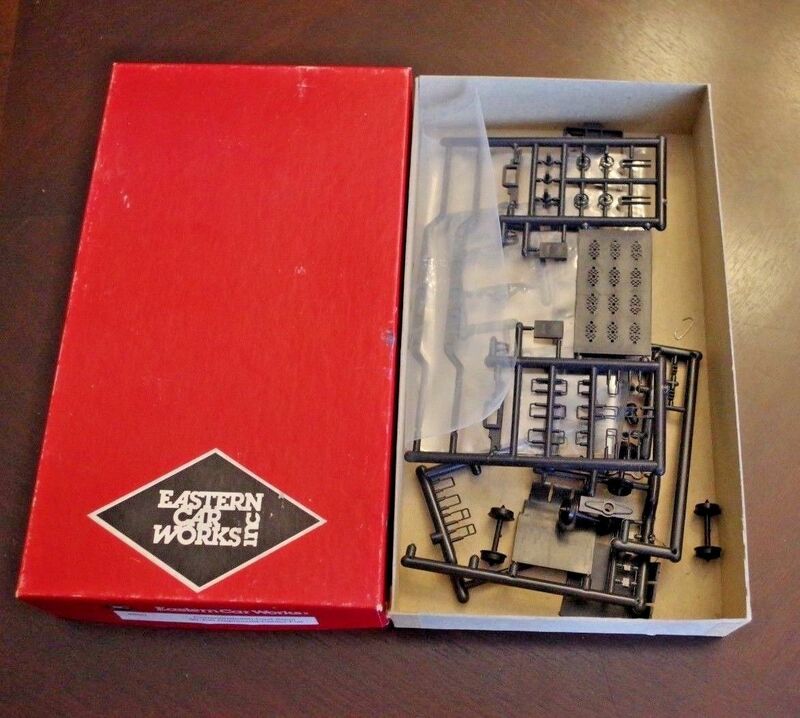 Although this kit isn't produced anymore, they are easy to find, and it's an interesting prototype. More importantly for me, it's an accurate model of an NH prototype. The body of the model is a very good replica of the cast body of the prototype. The details themselves are a bit course due to the injection-molding technology of the time, but it's easy to turn it into a nice looking model. The deck itself is beautifully rendered. In addition, a second class of NH depressed center flat cars (they designated them "transformer cars") is nearly identical, only needing to extend the deck at either end. I need to get a picture of Chris' (award-winning) ECW flat car. This is a series of flat cars rebuilt from boxcar underframes. It's a unique looking prototype. The Bowser kit is pretty accurate, but needs a few modifications like the addition of poling pockets and the work I did on the underframe. Speedwitch Media has decals available for this kit. (I couldn't find a picture of this kit that I could use). Recently produced by Exactrail, these are an accurate rendition of a 1951 UP prototype. This is actually a model of the NYC and subsidiary cars, and PM and W&LE are close matches as well. This is a clone of the USRA design with minor differences. To actually model the USRA prototype Richard Hendrickson noted that stake pockets #2, 4, 5, 8, 9, and 11 need to be moved to evenly space them across the side. In this configuration the CNW was the largest owner, and I may add additional roads once I verify their rosters in my era. The Atlas Pulpwood flat car is based General Steel Casting car built for the ACL in 1951. I believe GM&O, IC, L&N, and TN&O all had similar cars built by 1953. I don't recall seeing any photos, nor hearing of any pulpwood movements on the New Haven, though. So it's not a must-have for me. 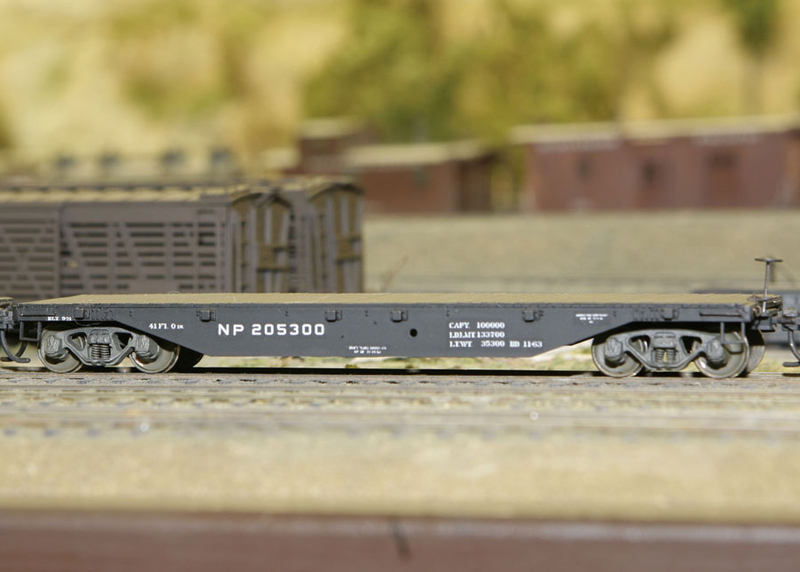 MDC has a 30' flat car that is similar to a Milwaukee car, and also the PRR F22. This is a very heavy duty flat car. The F&C resin kit is probably a better model at this point. Walthers has a GSC 53'6" Cast Steel Flat Car model in their Gold Line/Mainline series (depending on when it was packaged). These are simple kits, with molded on details. They were built starting in 1951 for the GM&O, with more built for ATSF and MKT in 1952. It was a long-lived car, with additional deliveries in 1955 and through 1969, many with bulkheads or equipped for TOFC service. From what I understand it's an accurate car, and is probably worth upgrading, especially if you model the late '50s through the '70s at least. There are quite a few options, actually, and most available RTR. But flat cars varied quite a bit from road to road, and even though there were a few standard flat cars, they certainly don't represent the national fleet. Fortunately, there are lots of resin kits available to fill in some of those spots. Before I get to those, I'll look at the other method I use to determine what's a good starting point for my roster, and that's the prototype data. In The Postwar Freight Car Fleet (Kline/Culotta from Speedwitch Media) they note that 15 roads account for 3/4 of the national flat car fleet. Of the top 15, the Milwaukee is the only road that doesn't have an accurate plastic or resin model readily available, other than potentially the MDC/F&C F22 model. Since that's a heavy duty flat car, it's not likely that it's the most common one on their roster. Charles Hostetler has a quick post on another series of MILW flat cars. So the next step was to fill in the options from resin kits. These fill in a lot of holes, especially with the more unusual flat cars. In addition to the ones listed below, Norwest Models produced two Canadian prototypes in resin. 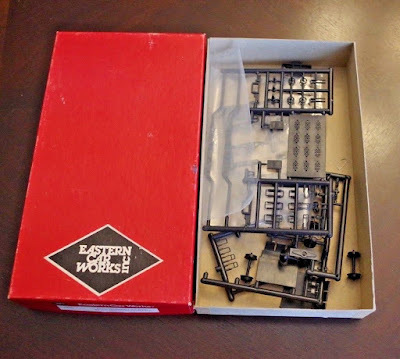 There were some other resin or part resin models, such as Westrail, Pittsburgh Scale Models, and Protowest, but these are hard to find and have been duplicated by other releases. Chad makes quite a number of flat car kits. These are just the major castings, no other materials are provided. But the price is right and the castings are fantastic. Ordering information is available on the Sunshine Kits website.. These are the ones that, as best I can tell, are appropriate for my era. Many PRR prototypes, along with a couple of northeastern roads. B&M Well Hole Flatcar with load. Speedwitch Media has replacement decals for the F29, F33 and FM flat cars (and containers). For me, the NH car is a must-have of course. Although Sunshine is no longer in business after Martin Lofton's passed away in 2013, many of the kits originally released by Sunshine are available from other sources now. However, there isn't a good source for ATSF prototypes other than the 70-ton AAR Flatcar. Sunshine kits are regularly listed on eBay, but they sell for premium prices. In my case, I have an ATSF Ft-L & N kit that I'm looking forward to building. RI 50' Spliced Flatcar (these prototypes were made by inserting a 7'6" section to the center of a USRA clone. It appears this can be accomplished by splicing together two Red Caboose kits. I haven't gone through the ORER of each of these roads to see if the available models address the largest classes on those roads. As always, the model roster is dependent upon the available models (or the ones I kitbash or scratchbuilt) which rarely coincides with the actual national roster. Chad Boas also offers kits for 3 CPR flat cars.